Finding generators for sale isn’t as difficult as it used to be thanks to the Internet, and competition has certainly increased the number of options available. Generators today are more powerful than ever, and any homeowner or entrepreneur can tell you just how important reserve energy is. Direct generators or electrical generators are machines that turn mechanical energy into electrical energy. Their operation is based on motion or dynamically induced EMF (electromotive force). As per Faraday’s Laws of Electromagnetic Induction, when a conductor goes through a magnetic flux, it produces dynamic EMF. This causes current to flow if the conductor circuit is sealed. If you’re looking for electric generators for sale you should understand how they work. A direct current generator provides electrical power with current and unidirectional voltage, and its operation is similar to that of synchronous generators. The voltage in the coil comes from the coils and is based on the magnetic field change rate. The induced voltage alternates in form because the coil flux decreases and increases with a zero average value. The field in DC generators is produced by direct currents in the coils or the stator magnets, while the armature or output windings are set on the cylindrical iron rotor slots. The design varies from model to model, but usually the rotor is equipped with a commutator or mechanical rotating switch that links the rotor coil to the terminals by way of the carbon brushes. For practical reasons, these generators are built with 4 to 8 field poles to reduce the rotor coils’ end connectors and also to minimize the magnetic iron required for the stator. The stationary brushes on the commutator are usually the same number as the poles, although this isn’t always the case. Power Inverters Vs Generators – Which is the Best? DC generators don’t use an inverter, making it more convenient to run. It reduces the complexities that come with running currents. The majority of DC generators are ideal for use in campers, RVs and small systems. You can use them in homes with a converter. Modern designs cost less and are no longer as complex. Direct generators are capable of running different things. The wiring for running larger systems has become less complex. It’s no longer a fire hazard as in the past. Wiring direct generators is now easier to manage. Direct generators are very efficient and are ideal for powering electrical appliances. However, for more complex operations, you may need longer wires. 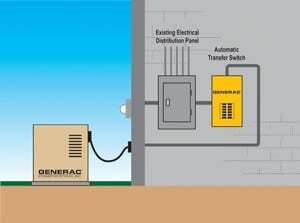 A generator transfer switch is set beside a generator’s electrical panel and is hooked to the major circuits you’ll be operating when there is a blackout. In case there is a power outage, you just need to crank the generator up, and all it requires is one power cord (or wiring) from the generator to the switch. Once the generator is running, you can just select the circuits to energize by flipping the appropriate switch. One of the things you’ll need to consider when buying a generator transfer switch is to size your power cord and/or wiring, as it will determine the dimensions and capacity of the manual transfer switch. In other words, if you require a 30 amp cord you’ll need 30 amp transfer switch. The more circuits you want to run, the more powerful the generator must be. Knowing how electricity works is necessary because it will give an idea of how much power you need. The simple rule though, is that the more circuits you want to run the more powerful the generator has to be. The specs will vary from machine to machine, but a 5,000 watt generator should be able to power up to half a dozen circuits. If you have a bigger generator however you’re going to need a 10 circuit switch. The majority of transfer switches today are pre-wired and have the circuit breakers set up. If you have a different type of installation you can buy a transfer switch with interchangeable breakers so you can customize it to fit your specific needs. The transfer switches, at least the manual types, usually has built-in wattage meters and is used to monitor everything that it is powering. Wattage meters are very important because without it you won’t be able to tell if the system is overloaded or not. If you’re going to install manual transfer switches you have two options: the first and easiest is to simply install it on the wall between the generator and the electric panel. This is particularly effective if you’re going to use the generator in a garage or in the basement. If you’re concerned about the aesthetics, you can always purchase a mounting kit that will recess the switch and inset it in the drywall in-between a couple of studs. Look for a switch that can cover all the circuits (and if necessary, only the important circuits) when used with a generator designed for your specific application. Some transfer switches are designed for use in residential homes. It is better if you get an all-around switch so you can use it for commercial and industrial applications. A well-designed switch system provides an efficient way to manage and monitor both essential and nonessential circuits. Provided that the transfer switch is properly designed, the system will automatically turn off the nonessential circuits to prevent overload, if necessary. You’ll also want to look for transfer switch systems that are compatible with smart management modules, as that will track the various circuits and supply power where it is required. It will allow you to get the most out of your generator. There may be cases when it is better to rent a generator than buy one. There are a lot of different types of generators available. Be sure you know what’s out there before renting. The main purpose of renting a generator is to save on costs. Calculate the figures first to ensure renting is less expensive than buying one. If you’re going to use a generator only once, you may be better off renting. However, if you foresee yourself using it a few times or more in a year, then you may want to consider buying one. If you’re going to rent a generator, do so only from a reputable company to ensure that the system runs properly and won’t be a fire hazard. This is especially true if you’re going to use gas generators. Keep in mind that some gas generators produce toxic fumes, so check the specifications and there are safety mechanisms built in. The importance of safety features cannot be overemphasized, especially if the generator will be used extensively, so it has to run as cleanly as possible. This is related to the above in a way, because if you’re going to rent a generator it has to be eco-friendly. What’s good for the environment is good for you. No matter what type of generator you rent or buy, you need to be certain that it’s been certified safe for the environment. Ensure that all aspects of the rent have been worked out. Do not sign to any agreement unless you’re completely sure. This is the best way to trust there won’t be any problems later on. There are a number of other things you have to consider such as the price, the reviews, and specs and so on. In a way you should check the generator out the same way as other products except in this case you’re renting. A generator wheel kit enables your generator to be portable. 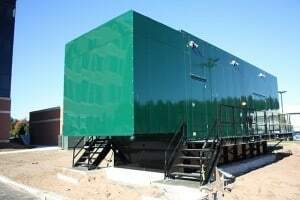 Usually generators are set in one location and run from there, but in some cases it’s necessary to move it around, (i.e. on a job site) and that’s where a good generator wheel kitwill come in handy. The majority of wheel kits today have never-flat tires, and really it makes sense to invest in one particularly if you’re going to use them on rugged terrain. Most of these generators run on specific types of generators and capable of supporting up to 5500 watts (or higher, depending on the kit). Most of these kits also have tubular steel handling so it’s convenient to use. Rubber feet are also pretty much a standard feature for stationary placement and stability. These wheel kits used to be expensive and considered as nothing more than add-ons, but they’ve become very important as portability and flexibility are now required from these machines. Yes there was a time when generators could be installed and used in one specific spot, but that’s not the case in business, commercial, and industrial establishments where different areas may need power. If the needs for each area are temporary, it’s more practical to buy a wheel generator kit than buy separate generators for each one. The good news is you can find these kits easily and purchase them online. Features vary per kit, but a typical one has two wheels, a fold away handle, and support leg. If you’re going to buy a kit, read some reviews to find out what people are saying about it, and in particular how easy –or hard- it is to install. A well-designed wheel kit should only take a few minutes to install. Generator wheels need to be of the highest quality so they don’t pop off while you’re transporting the generator. As mentioned earlier, rubber wheels are ideal, but other manufacturers use synthetic compounds which are fine provided the material is strong. Look for wheel hubs and axle that are steel. They should be very high quality. Take note of the handle, because on some kits it is higher than normal. Also check the design and make sure that the pads don’t make contact with the ground. You will find several different wheel kits online. Take time to review and compare them. While many of these are easy to use, some are difficult to assemble and require expertise. The bottom line is that when you’re shopping for wheel kits, look for those with durable high quality wheels that are capable of moving and transporting the generator you are using. When you hear the word propane, people often think of grilling hamburgers and steaks during summer. Nowadays, a growing number of generators now use propane because it provides several advantages over other gas generators. For one thing, propane generators (Check prices here) have cylinders that prevent spills, and in the unlikely event that propane does spill, it’s going to evaporate quickly. Propane offers other advantages; it burns cleanly and costs only half as much as regular gas per gallon. They run more quietly than gas. Generators that use propane are also handy in an emergency preparedness kit — or even just to prepare for a power outage — because you don’t need electricity to fill up the tank. Shelf life is very long too. You can store gas for only 12 months maximum whereas you can store propane indefinitely. Your concern should be the container because propane is going to outlast it. If you can get quality containers, you’ll be able to stock up on propane without worrying about quality degradation or that it will be useless by the time you actually need to use it. Look for the newer propane units as the older ones tend to have a somewhat complex fuel system. The newer systems also have built in safety features that ensure it doesn’t fail, and that if something does go wrong it is easier to fix. Keep in mind that propane powered units run best in warm weather and that anything close to below 20 F will affect performance. Look for portable generators because that’s going to make it easier to move the unit around. You may think that it isn’t necessary but it’s better to have one now than wish for it later. If your generator isn’t portable you can buy a wheel kit. Some generators allow you to use different types of fuels. This could prove useful if propane isn’t always available in your area. You’ll want to use propane because it has a low boiling point (-44 degrees Fahrenheit / -42.2 Celsius). This means there won’t be a problem with vaporization. Because you can store propane for extended periods, it’s the ideal solution if you only use generators on occasion. 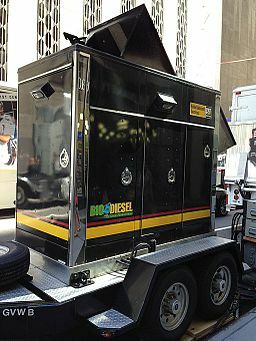 Since it’s a gaseous fuel expect your generator to operate smoothly and the emissions to be low. Propane generators are also no longer as expensive as they used to be. They have a longer life expectancy than gas. There have also been improvements in safety design. Propane generators are especially good for powering up small scale systems and other domestic applications. Unlike diesel generators, you can switch them off and on without fear of damaging the system. A small generator has the added benefit of being compatible with recreational vehicles. It’s also ideal for use on job sites where you need a power source. Due to its inherent properties, propane has minimal impact on the environment. It’s also a good choice among buyers living in cold areas where other fuel starts up as quickly. Check this review for the best Yamaha generator as well. This type of generator has many benefits, starting with the fact that your solar generator (Check prices here) will be using green, renewable energy, which is good for the environment and is also appropriate for outdoor and emergency applications. The solar industry is growing at an exponential rate. You can choose from a wide range of solar powered units. Your choice should depend on your power output requirements, its size, price and weight. Of course these requirements will vary from person to person but the following general guide should prove useful. Today you can find portable generators styled like briefcases, making movements easier. More than aesthetics, a portable generator will make it easier for you to move from one area to another. Depending on your needs, you may get more use out of a portable generator. The generator should have a collapsible and robust handle. The wheels also need to be comfortable and won’t get flat. Basically what you want in a portable generator is durability especially if you’re going to use it on rough terrain. Solar energy is known for its expandability, and generators should be no exception. You will never know just how much power you will need. Therefore, it’s best to get a generator that allows you to increase output easily. You might think that you just need a specific amount but as time passes by this could increase. Some of these solar generators are expandable via batteries while others by way of solar panels or both. Be sure the unit is expandable because it’s going to be cheaper than buying another generator. One of the trademarks of a quality generator is a lightweight design. Generators used to be huge, bulky machines that were incredibly noisy and difficult or impossible to move. Do keep in mind though that the more power you need, the more powerful –and heavier- the unit will be. A high end generator powered by solar energy is going to have several extra panels, batteries, and inverters. Generators built for rugged use are also going to have a larger and more heavy duty case to meet these requirements. If you’re going to use this generator outdoors, make sure it’s certified durable and built for outdoor use. A rugged generator must have a solid body, be portable. It should work regardless of how rough the condition or weather is. Don’t let price dictate the type of generator you will use. It really all comes down to quality. You’ve probably heard this before but it bears repeating here. Don’t settle for a mediocre product because it’s going to cost you more later on. When you need power at your job-site, home, or recreational use, the Ryobi 2,200-Watt Inverter Generator is ready with clean, quiet power. The information above should give you enough of an idea what to look for in generators for sale. Regardless of the product you decide to buy, assess their specs to determine if it fits your needs. This might take time but it will definitely pay off later.